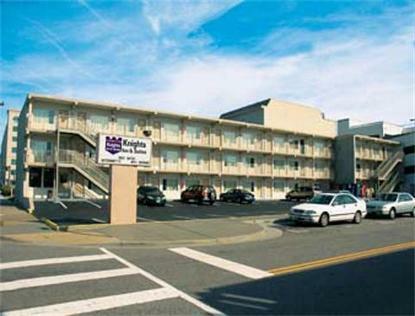 Welcome to the Knights Inn and Suites of Virginia Beach, Virginia. All rooms are 2 room Suites with or without Kitchenette. Living room with Sofa Bed and separate Bedroom with 2 double beds. Free High Speed Wireless Internet Access in all rooms. Free Unlimited local and toll free telephone calls. Ice machine, soda machine, and Non-Smoking rooms available. No Pets Allowed. Located just one half block from the beach. Walking distance to shopping, restaurants, and entertainment stages. **HOTEL POLICY: You must be 21 or older to register for a room. A Credit Card Deposit of the first night's room and tax is required and processed immediately upon the confirmation of your reservation. All reservations must be canceled 72 hours prior to arrival in order to receive a deposit refund. Reservations canceled less than 72 hours in advance are subject to forfeiture of their deposit in full. Hotel can be contacted toll free by calling 1-800-523-2584. Please be advised there is a 10 EXTRA CHARGE for third and fourth persons.